Susan Guthrie, Esq. and Rebecca Zung, Esq. join us to talk about how mindfulness can be brought into the mediation process, for the best chance at a win-win resolution. It is possible to step away from the fear and conflict that typically defines divorce. This quote from Rebecca Zung’s book, Breaking Free: A Step-by-Step Divorce Guide to Achieving Emotional, Physical & Spiritual Freedom really sets the tone for this episode. After following similar career paths in family litigation and high net worth divorce, Susan and Rebecca met just last year. Following the publication of her book, Rebecca wanted to start a podcast. She met Susan and they clicked. They both felt that the more common adversarial process often ends up in a loose-loose result. They decided to join forces on a mission to create a better way for people to move forward, changing what it means to “win” a divorce. B.Y.E. Retreat with Worthy – Join us for this “Best You Ever” event! Jennifer: Welcome to Divorce & Other Things You Can Handle, a branded podcast from Worthy. I’m Jennifer Butler, and I’m your host. Divorce represents the ultimate paradox. It is one of the most traumatizing times in your life and the time in your life that requires you to be the most clear thinking. This is a quote from one of our guests today, Rebecca Zung. Trauma and clarity. Is it possible to accomplish navigating these two states of being during such a difficult time in our lives? And if so, how do we do it? It may sound impossible, but Susan Guthrie and Rebecca Zung, who are here with us today, have dedicated their work to teaching others the importance of breaking free from the traditional perspective on divorce. A perspective that, for the most part, is one of mostly negativity and conflict. But when we’re able to create a different narrative around divorce and approach it in alternative ways, winning in divorce takes on a whole new meaning and sets the stage for you to win in life. Susan and Rebecca are here today to talk to us about how you can accomplish this in your life. I am thrilled to bring this dynamic conversation to you here today. We’re going to take a quick break, and then we are going to be back with Rebecca Zung and Susan Guthrie. When you sell a piece of jewelry, you can’t control how much it’s worth, but you can make sure that you’re selling smart with a team of experts and advocates behind you at Worthy. Your engagement ring can be a financial asset that allows you to embrace a new and fulfilling life after divorce. Let us help you get the best deal possible for the jewelry you’ve outgrown. Go to Worthy.com/podcast to learn more. We have two guests joining us today. First, Rebecca Zung, US News and Best Lawyer in America honoree, has been revolutionizing the conversation about divorce since 1999 and has been privileged to guide thousands who were stuck in divorce, drama, trauma, and chaos to step into lives of freedom, possibility, prosperity, and purpose. Now based in Los Angeles, she is continuing to serve the divorcing population and remains a partner in the esteemed law firm of Long, Murphy, and Zung. Rebecca is also the author of the bestselling book, Breaking Free: A Step by Step Divorce Guide for Achieving Emotional, Physical, and Spiritual Freedom, and is a highly sought after media contributor. Her perspectives are in high demand by television and print outlets, as she has been featured in or on Extra TV, Forbes, Huffington Post, Newsweek, Time, Dr. Drew, NPR Talk Radio, Good Day New York, and CBS Los Angeles, among others. Our next guest, Susan Guthrie, recently named by Lawyers of Distinction as one of the top family law and mediation attorneys in the country, has been helping individuals and families navigate separation and divorce for almost 30 years. A former longtime litigator, specializing in high net worth and high conflict cases, Susan’s practice is now focused on the non-adversarial approaches to divorce, and she is presently licensed to practice law in California and Connecticut. As a leading dispute resolution professional, Susan is proud to be the incoming co-chair of the American Bar Association’s Section of Dispute Resolutions Mediation Committee, and to serve on the Board of Directors of the Southern California Mediation Association. 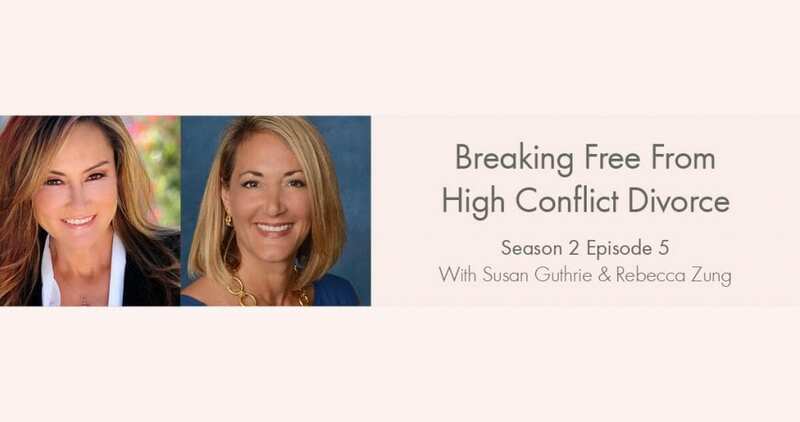 Together, Susan and Rebecca are the co-founders of Breaking Free Mediation, the first family law mediation centers in the country to offer a mindfulness track to help divorcing parties to negotiate their issues peacefully. Breaking Free Mediation offers online mediation services nationwide. Susan and Rebecca are also the hosts of the iTunes Top Ten podcast, Breaking Free: A Modern Divorce Podcast, which is revolutionizing the conversation around divorce, and I am honored, thrilled, grateful to have both Susan and Rebecca here on our podcast as guests. Thank you both so much for joining me. Susan: Thank you, Jen. We’re happy to be here. Rebecca: Yes, thank you for having us. We’re thrilled to be here. Jennifer: So excited. And I love the conversation that we’re going to be having today about this non-adversarial approach to divorce, and your unique take on it and your unique action around it. So I would love to start with both of you taking some time to just share a little bit about your stories and why you’ve chosen to do the work that you’re doing in this field. Rebecca: But you end up in this field, and I think for both of us, we have been on this path separately, and then we ended up meeting last year, of making it a better field. Making it a better space, making it better for clients. I wrote my book, Breaking Free, it came out in 2013 now, so almost six years ago, and I just really wanted a resource for people to be able to not just get legal advice, but also advice on how to deal with fear, and anger, and resentment, and also how to start your life after and have it be an opportunity to create a new beginning and a new future. So I wanted to start a podcast. I had met Susan, and she was also on this amazing path, and we had so much synergy that it just made a lot of sense. So now, here we are, and our podcast is close to 200 thousand listens a month in just maybe six or seven months now, so it’s been a really, really incredible journey and we’re just trying to help people through the trauma of divorce every single day in whatever way we can. Jennifer: I was just going to say, I was shocked that it’s only been a year for you guys. You have such synergy that my assumption was that you’ve been together so much longer. You’ve done so much in that short time. Susan: We hear that all the time, and honestly, when Rebecca and I met each other, we just immediately found that, first off, our career paths had been so similar. We both, for years, were longtime family law litigators in the adversarial process of divorce, we both specialized in high net worth, high conflict cases, and we both had come to a realization that that process, that litigation process, while it was a way to get people separated and a way to move them through the divorce process, it ended up with most often, a worst result personally for those clients because that adversarial process just ripped people apart, it destroys any possibility of going forward in a better way if they have to co-parent, and we were both looking for other ways. Rebecca with her book and with her program, and me with mediation and other elements. So we were trying to find better ways for people to move forward through the process so they could go forward better in life. Jennifer: Yeah, and that’s exactly why when I first saw your website and talked to you guys, I automatically thought this idea of winning, “winning” in your divorce, really meaning something different in the way that you guys approach it and how that sets you up to win in life. So that’s how we ended up talking about this today. Rebecca: Yeah, people usually think of winning as, “I get everything I want out of my divorce.” Or whatever. And that just means the other person ends up completely miserable, and anyway, no one ever gets everything they want. Jennifer: Exactly. And then I think sometimes you get what you want and then you find out it’s not what you wanted anyway. Susan: Well that’s very true. We actually just talked about that in one of our shows because the things that you fight over because they’re so vitally important during the divorce process, so often you wake up when you come out of the divorce fog and you can’t believe you spent that much time and energy, and frankly, money, arguing over those things, rather than just moving on and getting on with your life. Jennifer: Absolutely. So Rebecca, you say that divorce is the ultimate paradox. Can you talk to us a little bit about what this means and why this is so important for our listeners to understand. Rebecca: Yeah. It’s something I just kind of thought of several years ago and it’s in my book as well, and it’s just, it’s like this crazy paradox. It’s the ultimate paradox that, during the most traumatic time of your life, which every hole that you look at says that divorce and death are the most traumatic things you can go through. In fact, incarceration is number three, so apparently people would rather be incarcerated than get divorced. But during that traumatic time, they have to make the most critical decisions about their lives, about their money. The things that mean the most to them. Their children, their homes, their businesses, because all of those decisions will impact the future, whether it comes down in a court case or whether they sign a mediation agreement or a marital settlement agreement, all of that stuff is stuff you have to live with for the rest of your lives. So it’s so crazy that there’s this paradox that during the most traumatic time of your life, you have to make these critical decisions. Jennifer: Yeah, and I guess also find a way to slow down, right? In a time when you’re hoping everything will just hurry up and be over with. Susan: A lot of the time, and this is more of that paradox, what happens is because of your emotions, because you’re so caught up in those negative emotions. I mean, none of the emotions around divorce are the happy, joyful ones. It’s all fear, pain, anger, sadness, hurt, betrayal. These are not things that people work through quickly, and they’re emotions that drive your thought process, so people will tend to get bogged down in those emotions, and instead of making clear, rational decisions about what is best for them and what’s best for their children, they make decisions out of fear, out of anger, out of the hurt, and all that really does is wind them further down into the process and drags it out longer. Unhappy, angry, hurt, sad people don’t tend to be reasonable. Susan: So even if you want to hurry and you want this horrible time to be over, often your own emotions are what are keeping you in the process. Jennifer: Right. And this is where I think your approach, you and Rebecca, this mindfulness track that you have incorporated into conflict resolution so that you’re not approaching this, “We’ll do the divorce over here and you work on yourself over there.” And keeping it separate. You guys have somehow created the first ever conflict resolution center that includes a mindfulness track. How do you bring that all together? Rebecca: Well it’s a traditional divorce mediation center except for the fact that it also has the option of being able to add a mindfulness track, meaning that they have access to meditation teachers or other professionals who can help them get centered and think more clearly. And even if they don’t choose the mindfulness track, we start all of our mediations with a centering technique and setting intentions that we will find a peaceful resolution, that we will come to a resolution that everybody can live with, and just creating an environment of peacefulness and setting an intention that the issues will be resolved. And we also, by the way, offer online mediation through the Zoom format, which is also cutting edge technology, for mediations anyway. Jennifer: Yeah, absolutely. Just the act of setting an intention and grounding into that, I think right off the bat probably sets the stage for how the rest of the conversation will go. Is that right? Susan: Yeah. It’s an interesting phenomenon with people going through divorces, again, often so mired in emotion, they will come in for mediation or appear on the screen as we’re doing our online mediation, and they haven’t really put a lot of thought into what they would like to see their redefined future as a family look like. They have thought about who’s going to get what, who’s going to pay what, and they think about the minutia of those details, but this overall picture of how they would like to restructure their family, how they would like to restructure their communication with each other as they go forward and perhaps co-parent or coexist in the world, so bringing them back, especially in that very first mediation session, to thinking about those things and thinking about the fact that they’ve chosen a non-adversarial process, they’ve chosen a cooperative process. Mediation is 100% a voluntary process for people to choose. It’s not compulsory like litigation is, and by choosing that, they’ve already come to one agreement. They’re already on the road to coming to their agreement. They’ve chosen to go through this non-adversarial path, and where else can they agree? Can they agree to take this path in peace, in a spirit of trying to find the best solution possible for both of them, and if they have children, for their children as well. Jennifer: Right. So you guys talk about the spiritual laws of divorce. How does that fit in here and what are those? Rebecca: Well, the spiritual laws of divorce are something separate, and I kind of think of it in terms of, in all lifeforms, there are times of winter and there are times of spring, and looking at divorce as maybe a time of winter or maybe it’s a time of death, there’s always times in your life that you grow from, that you have to learn from. We recently just interviewed Jeff Bullas, that episode just came out, and he is an international digital marketing guru, but he said that you don’t learn from comfort, you learn from the difficult times, and he just experienced a difficult time in his life. So I look at that as the spiritual law of divorce is that everything comes to an end sometimes, and sometimes it’s just not meant to be, sometimes you have an expired future, and it just means that you’re clearing negative energy and creating an opportunity for more positive energy to come in. Jennifer: Mm-hmm (affirmative). Yeah, and bringing that into the way you mediate puts a whole different perspective on the process itself. Susan: Yeah. The mediation process much more so than the traditional divorce process, litigation, is really forward focused. Susan: Clearly, the party’s paths that brought them to this splitting up, this taking different paths, but in some ways, their paths are still going to intersect, and we try to keep that forward focus and positivity because, and this is one of those areas where Rebecca and I immediately connected, the fact is that change is hard, but change is where we grow, and change is where you have to stretch to achieve new things, and good things can come from that. A lot of what can happen has to do with your mindset and your approach to the process. And again, we’re very committed to mediation as a cooperative approach to achieving the best outcome for both people. Jennifer: Yeah, and I like how you say it’s forward focused. We are going to take a really quick break right here, but when we come back, I want to delve into that a little bit as far as how the entire perspective on divorce itself, how we can shift the conversation that we’re having there. So we’re going to take a quick break and then we are going to be back with Rebecca Zung and Susan Guthrie. When I decided to sell my jewelry after my divorce, the most important thing to me was finding a company that I could trust and one that would also advocate for me. I found this and so much more at Worthy. Their expert staff immediately put me at ease and helped me to get the best price possible for my jewelry. Your engagement ring can be a symbol of your freedom, your journey, and the choices you have made to live your life on your terms and create the future you desire. Let us help you get the best deal possible for the jewelry you’ve outgrown. Go to Worthy.com/podcast to learn more. We are back with Rebecca and Susan, and we are talking about how winning in your divorce, “winning” in your divorce, can set you up to win in life, and we’re talking about not winning from the perspective of getting the things that you think you want, but really going through your divorce in a way that is forward thinking and sets your family up to succeed in the long term. What I would love to talk about with you guys is, divorce, it’s shifting for sure, but for the most part, it still kind of has this negative, conflictual light around it. So even though so much of the population experiences divorce, there’s still all this judgment, there’s still all this isolation. What are your thoughts on that perspective and how we can begin shifting it and shifting the conversations that we’re having? Rebecca: It’s funny that you say that because I’ve always said that in some ways, divorce is like a death. I mean, I’ve, thank God, never had to experience the death of a spouse, but I have gone through a divorce, but in some ways, I think it’s a little bit worse because when a spouse dies, people rally around that person, there’s a dignity in death. People are bringing casseroles to that person, inviting them out, doing things. When you go through a divorce, people don’t want to get involved. They don’t want to take sides. They stay away from the couple, so the people end up more isolated sometimes. And there is still that stigma around divorce, unfortunately. So I just look at it as, if somebody is in a relationship that’s not serving their soul, that’s not empowering them, they shouldn’t be stigmatized or looked at negatively because they’ve decided to get out of that situation. Where’s the dignity in being in a horrible marriage for 40 years? How is that a way to live? Jennifer: Right. Absolutely. And I think what a lot of people end up hearing is, “You took the easy way out.” Divorce is far from easy, right? Rebecca: Definitely not the easy way out. Susan: No. Definitely not. But I think there’s also, for many people, I know when I went through my own divorce, there’s a feeling of failure that’s associated with a marriage not working out that’s personal, you feel like for whatever reason you could not make the relationship work, and that can be very difficult for people too, and perhaps goes to that stigma. And there’s also, one of the things that I found most difficult to deal with is that my future was suddenly no longer clear. I had a situation where I thought my life was going to be one way, I was going to be with this person for my lifetime, and we were going to follow a certain path, and suddenly, when divorce became the obvious choice, I knew that it was the obvious choice, but it was still difficult to deal with the black void of the future without knowing what that was. Susan: And that’s where that fear component comes in that we were talking about earlier, and I also think that that’s one of the other elements that makes it so difficult for people. Why people will live in the limbo, like Rebecca said, in a relationship that’s not serving your soul, why people will live in those relationships because sometimes maybe that limbo is better than the unknown future that is out there without this relationship. Jennifer: Yeah. You know, I’ve always wondered too if being in conflict is actually something that people will feed into because the conflict at least keeps you in a relationship, but once that conflict is gone and you kind of go your separate ways, there’s that nothing, and what you’re saying, that uncertain future is in front of you, and that can be terrifying. Rebecca: Yeah. We, as humans, we want to know things. Our brains don’t function very well if we can’t predict, if we can’t know what’s happening. And that’s the worst part of divorce, because there is that period of time, I always say to people, you’re on land right now. It’s not the greatest land. You can see that better land is ahead, but you have to get on this boat and get tossed around by waves, and you’re going to probably get seasick and all this stuff is going to happen, and that’s the divorce period. And that’s what you have to go through in order to get to the other side. It’s just a terrible period because you don’t know how much money you’re going to have left over, you don’t know how much you’re going to see your kids. Rebecca: And that’s where the mediation process really can help get to a resolution faster than through the litigation process. And much less expensively. Jennifer: Yeah, and almost I think it gives you as a couple, or as a divorcing couple, a little bit more control because when you go the litigation route, really you’re putting your life in the hands of the judge, of a third party. Susan: Yeah, we always say that. When you go to court, you’re putting the decisions in the hands of a stranger in a black robe. Susan: And a judge only has a limited amount of time to hear the facts of your case. They’re going to hear from both sides, and then they have to apply the law to it. And the beauty of the mediation process is that it’s the two people who are intimately involved in their own future who make all of the decisions. People misunderstand mediation and think that they’re going to go there and the mediator is going to make the decisions sort of as a quasi judge, and that’s not the process. The mediator is there to help the two individuals to understand their issues, to understand the law around them, and the other elements that need to be determined, and then to help them have the conversation so that they, together, determine what is the best way to go forward. The goal is always, in mediation, to try and find the best win/win you can for the two people, for them to find what works best for both of them. They pick and choose what they can and cannot live with, so that’s a very different paradigm than going into a courtroom flinging the mud at your soon-to-be ex and letting some stranger make decisions about your life for you. Jennifer: Yeah, no, that’s a very, very different process and a different outcome, long term and short term. So when you guys talk about fear, and I know this came up a couple times in our conversation, I think that that fear that you feel when divorce is suddenly a part of your life oftentimes will lead people to think, “Well, litigation is my only option.” You hear, people will say, “Make sure you go see the top three.” You’ve got to go see the top three so that your ex can’t have them. It’s this automatic push into making decisions from fear. Rebecca: That’s the first thing they think of rather than thinking outside the box, and that’s part of the reason that we started Breaking Free Mediation and why we do the podcast, which is also called Breaking Free, because we want people to know that there’s an alternative out there, that you don’t have to go lawyer up immediately, that you can go to mediation. And mediation doesn’t mean lay down and just let the other person walk all over you. Of course you’re still going to look at what’s fair under the law and go for that because lawyers are hired to advocate, that’s their job. Susan: Yeah. Advocate equals argue. That’s really … your attorney is there to understand what you want or what you say you want and then go in there and do the best they can to argue for you getting that, and usually that entails the other party not getting something that they want. And it’s set up as a me versus you. It’s set up as an adversarial thing with someone else making your decisions. So with mediation, the two people themselves, as I was just saying, they get to make the decisions. And really, a decision that you both have buy in, so you both have participated in talking about it, negotiating it, discussing it, and deciding what works. That’s an agreement that’s going to hold. That’s an agreement that’s going to stick. Something that someone else tells you you’re going to have to do, none of us do very well with that, and those tend to be the ones that you get that ongoing conflict cycle because sooner or later, one of the parties to an imposed decision is going to be back in court trying to change it. Rebecca: Right. They’re going to appeal it probably, and if you come to your own agreements and it’s not appealable, then you know you have finality. And that’s a big piece of it too. You know you’re not going to keep fighting, because even if you win everything you want in court, it probably won’t stick because the other person is going to appeal it. Jennifer: Right. Yeah, and when I hear you say that, it’s like, there’s ownership when you’re both making the decision. There’s ownership on both parts of not only the decision, but the outcome. Susan: Exactly. And you both have decided what you can and can’t live with. Susan: When you’re negotiating, it’s cooperative, it’s collaborative. You’re not going to get everything that you want in mediation, just as you won’t in litigation, but you pick and choose what works and what won’t work, and that’s a very different thing. Rebecca: Plus it’s a much more private process too. Jennifer: Yeah. I think that is one of the most shocking things about going into litigation for a divorce is going into the courtroom and realizing that it’s public. Susan: Correct. Anyone and everyone can be sitting in that courtroom, listening to whatever it is that needs to be talked about that day. Rebecca: Yeah, and there’s another point that Susan and I say all the time too, and that is that people have these skewed notions about what is going to happen when they go into the courtroom. Somehow they think, “I’m going to tell the judge all of this stuff and the judge is going to see how my soon-to-be ex is so awful and I’m so wonderful.” And it just doesn’t really work out like that. Rebecca: [crosstalk 00:29:59] evidence, and the judge … you can’t just, narrative form, go in and tell everything you want to tell. You have you have evidence to back up every single position, it has to be presented in a certain way, the other side gets equal amount of time to present their argument, and the judge makes his or her decision based on the way he or she sees it that day, and it may not be what you think it’s going to be. Susan: Yeah, it usually isn’t. Jennifer: Right. Exactly, and it usually lasts longer, I think, too. It’s a slow moving process. Susan: Oh yeah. You aren’t the only people in that courthouse getting divorced who need a judge. If you’re litigating, your average litigated case can take a year, two years, even longer. Susan: Mediation moves at the pace that you set and it’s basically scheduling appointments. With the online mediation, it’s really the ultimate in convenience because you can be at home, you can be at your office. As long as you’re somewhere private where you have a good connection, you can sign on and work on these issues. And most people work through that process infinitely more quickly and much more cooperatively than waiting for the court to have some time to hear your case. Jennifer: So what do you say to somebody who’s listening right now who is just starting this process? They’re listening, they’re interested, they’re willing to consider this, but they’re afraid. They’re afraid that if they don’t lawyer up, they’re going to get “behind the ball”. What do you say to them as a path they can put forward? Rebecca: Well, of course we’re going to say they should go to BreakingFreeMediation.com. Also, listen to our podcast. We have 30 something episodes now, giving tons and tons of information that normally people would have had to pay hundreds of dollars per hour to get. Not just from the two of us, but also from the top experts from around the country. Definitely listen to the podcast, get my blog, go to BreakingFreeMediation. We have dedicated our careers to helping people see that there are other paths than scorched earth litigation. Susan: Yeah. Just another point as to mediation, if people are at that point where they know that divorce is in their future, then this is the time, before they get to the process of lawyering up or going that traditional route, to sit down, or send an email, or have a conversation somehow with their spouse and say, “You know, there are a lot of reasons why as grown-ups we should be able to sit down and work this out together. I’d like us to consider this process of mediation.” Usually there’s a reason why the other person would be willing to consider it, and you two have been married for a while, you know what motivates your spouse. There are usually things, that you want to keep it peaceful, or you want to work things out in the best interest of your children, or you want to work it out more quickly, or, a very big motivating factor for people to at least consider mediation is that it’s much less expensive than traditional litigation. Many people want that autonomy, where they’re making their own decisions, not having them imposed. So it’s time to have that conversation about why this is a better path for both of you and for your family. Jennifer: You can’t lose. You could at least try, right? And if it doesn’t work, there’s always the process of litigation if you have to. Susan: Yeah, the lawyers are always going to be there. Susan: Ready to pick up the case, and the judge will always be there to take up his gavel or her gavel. Susan: But at least you then know you tried. Jennifer: Yeah, exactly. Exactly. So this is one of my favorite questions I like to ask because you guys are sitting in a very unique perspective of divorce and you’ve seen multiple things, your own experiences with it, so from where you sit, what is possible for anyone going through divorce when they make a conscious and thoughtful choice to go through something like Breaking Free Mediation? Rebecca: Well, what’s possible is what we were saying, and that is to create a new life with peace, and freedom, and keeping as many of your dollars in your wallet and in your bank account rather than lighting a match to it for litigation. [crosstalk 00:35:08] doing. Just to hire a good attorney. I know myself because this is what I charge and what a lot of people charge. You have to charge large retainers and a good hourly rate, and that’s what you’re going to be in for if you choose the litigation track, and you will burn through those dollars because just for them to spend the time drafting motions or going to hearings and showing up in court costs lots and lots of money. So I would say what’s possible is getting to that freedom, that new life, that place of peace that much sooner and with that much more money left over. Susan: Yeah. I would also just add that you can also choose to move through this process, as we were talking about earlier in this episode, most people are in a bad place in that relationship by the time they get to the decision to divorce, and if they choose a process that helps them to break things down and to redefine their family, to work through their finances cooperatively, they can go forward in a better way. Their life is already better because they’re not now just in that limbo of a bad relationship where their soul is not being fed, as Rebecca said, and I’m just going to paraphrase our friend, Gabrielle Hartley, in her book, they can be better apart. They can go forward in that way that lets them still be whatever they are going to be to each other, but hopefully still good co-parents and be better apart and be in a better place than where you are in this relationship that is dysfunctional and not working for you. Jennifer: Yeah. Exactly what this episode is about. Really winning in divorce is what we’re talking about, and that’s setting you up to win in your future life, so it’s perfect. Thank you so much to both of you for being here with me and talking about this. Where can anyone listening find you and follow up with you? Rebecca: Well, certainly iTunes or Stitcher, Breaking Free: A Modern Divorce Podcast, or at BreakingFreeMediation.com. Susan: Yeah, and just to mention, we’re also going to be doing a series of divorce retreats with Worthy around the country. They’re called the Best You Ever, or B.Y.E Divorce Retreat, so you can find more information about those on our website, BreakingFreeMediation.com, and we hope to see you there. Jennifer: So excited about all of that, and we’re so grateful to be working so closely with you both. Jennifer: Make sure you subscribe so you can catch every new episode of Divorce & Other Things You Can Handle in your weekly feed. If you like what you hear, rate and review us to help other women like you find us. This podcast is for you, so email us at Podcast@Worthy.com with any questions or ideas that you may have. We look forward to hearing from you.